When I was a little kid vacationing with my family in Florida, my dad pointed out the beginning of Hwy 1 in Key West to me. He explained that the highway travels all the way up the Atlantic coast and ends in Maine. I always wanted to get to the other end of Hwy 1, and with our summer trip to Maine, I finally got a chance to fulfill my quest...and to place yet another letterbox at the north end of a famous US highway (cf. Hwy 41 box). 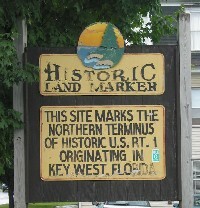 Start in Key West, FL and take Hwy 1 north 2209 miles to Fort Kent, ME to its very end. The end is a bit difficult to find as it is not marked by the usual highway markers. It is marked by a historical sign across the street from Rock's Diner, about 100 feet before the US customs station. I would suggest parking at Rock's Diner and then carefully cross the street to the historical marker. Once at the marker, read both sides of the sign, as they are both different - it all depends on your perspective which of the two sides you agree with. Also make note of the official "H" stone highway marker at that location - marking that spot as the official end/start of Hwy 1. Now, from the north post of the historical sign, take a bearing of three hundred twenty "1" and take sixty "1" steps on that heading through the parking lot and up the embankment, across the "Maine Healthy Walks" path to the small caution sign. Be sure to watch your final steps down to the caution sign post - or you might find an easier way down to it. The box is located under some loose stones under the large rock behind the post holding the caution sign. The box is camouflage-taped so it blends in to the stones well. Note: Since I am not from the area, I'm looking for someone in the area who would be willing to check up on it every so often.